On a rainy Thursday evening, Bardot music lovers dashed from the cover of their cars and into the hazy venue, away from the rumble of clouds for the night. Zola Jesus had finally arrived to Miami, bringing her stormy sound with her. With a DJ set from Lolo and two opening bands, it promised to be a late night brimming with music and cigarette smoke. After an appropriately gothy set from Lolo, one of Miami’s most intriguingly gloomy bands, Axe and the Oak, took to their instruments. Beginning their set with a dismal yet hypnotic intro, their music seemed to drag the bar-goers away from their chatter of the new Sasquatch Lineup, and, tugging on their ears, lure them into the performance. Watching them play, a series of band names flashed in my mind’s eye-The Doors! Joy Division! Nick Cave! Echo and The Bunnymen!- and they all had their place and justification. But one thought that was always prevalent, was that they sounded like the perfect score to an 80’s vampire movie. And considering their subject matter and style, I don’t think I was too far off. Playing spooky tracks like Jack the Ripper and, get this, Vampire, they had a naturally captivating presence in front of the audience. Shoegazey and pensive lead singer, Sander Willig, had a compelling intensity about him that kept the audience hooked. Sinking deep into his knees, swaying and jerking innately, ominously crooning Jim Morrison-eque vocals, you’d forget they were a local band. They weren’t all gloom though, as their 8 song set moved along, things picked up theatrically with Joy Division-y bass parts as they exemplified more of their post punk influences. As their time on stage (carpet) came to a close, their sound had created a vibe that fit the night’s headliner perfectly. Not so fast, though! Before our anticipated headliner could commence, there was one more opening band, Talk Normal. The two man, or should I say, two woman band from Brooklyn, New York, took to the carpet and at 10:30, launched into their set. With both drummer, Andrya and guitarist, Sarah participating in the vocals, most of their songs followed this format: blaring and distorted guitar chords and howls of call and response lyrics, all clashing under a constant quick paced drum beat. But their noise soon became indistinguishable and predictably arranged. The two girl’s wails were incomprehensible, and, though an interesting and intriguing band to say the least, they took away from the atmosphere that the previous band had created. 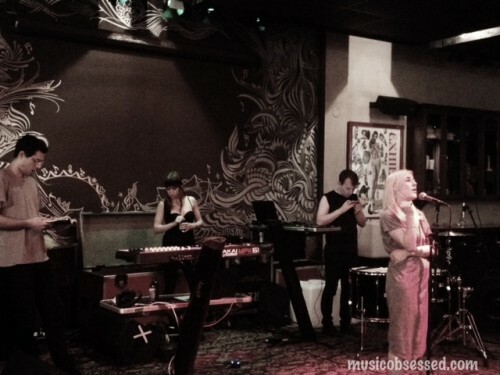 But after some investigation after the show, I understand why they are touring with Zola Jesus. Their music is clangy and different, but there is something enticing about it, it just did not transfer well live. Finally, at around 12:15, the esteemed Zola Jesus walked in, only to collapse theatrically onto the carpet, arms outstretched, face down. As the music began, the surprisingly tiny girl started to crawl and pull herself up to the microphone. With the first note she sang we were immediately enraptured. While hauntingly howling she thrashed her body around, slowly striding around the carpet and into the crowd. She danced as if no one was there, tangling herself in the microphone cable, moving her body sporadically. But at the same time, she performed very outwardly to the audience. Weaving in and out of the clusters of non dancers, she sang directly too them and thrashed around even more, with an attitude of “You’re not going to dance, then screw you, I WILL.”. We could see some of her punk influences in the careless way that she performed, climbing on tables and running around barefoot, she was surprisingly wild and feral. But the enchanting thing about her was, while flailing uncontrollably with unrestrained movement, her voice remained immaculately composed as she belted out each song without a vocal crack. She had a sense of control that, combined with her fierce willingness to let go, made for one of the greatest shows I’ve seen at Bardot. The setting was perfect and she worked with her surroundings and made them a part of it. Playing 14 songs, I left with a proliferated sense of respect for her and her music. Zola Jesus IS an artist and it was a privilege to experience that artistry first hand.